The Yak-38 Forger used two in-line Rybinsk RD-36-35FVR lift engines (6,722 lb thrust each) immediately behind the cockpit inclined with the engine exhaust at 13 rearward. One Soyuz Tumanskiy/Khatchaturov R-27V-300 turbojet (13,444 lb thrust) was mounted in the center fuselage and exhausted through two hydraulically actuated vectoring nozzles (connected by a transverse shaft), one on each side of the fuselage just aft of the trailing edge of the wing. The first prototype flew in 1971 and the Yak-38 (originally designated the Yak-36M) first appeared to the West in July 1976 when the Kiev deployed with a developmental squadron of Forger-As and traveled through the Mediterranean. 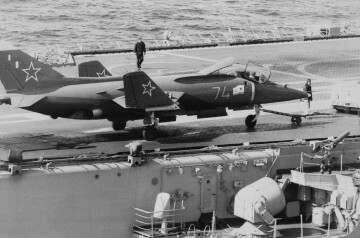 The normal complement for the Kiev-class through deck aircraft carrier was a dozen single-seat Forger-As and one or two twin-seat trainer Yak-38U Forger-Bs. The primary roles were fleet defense (particularly against shadowing maritime surveillance aircraft), reconnaissance, and anti-ship strike, but was never used in combat. The Forger was removed from front line service in 1992-93, although a few remained in the inventory for another year as limited proficiency training aircraft. A total of 231 aircraft had been built by the time production ended in 1988. Resources related to the Yak-38 Forger, provided by the Vertical Flight Society. Resources related to the Yak-38 Forger, provided by public sources across the internet.